In the late 70s during the midst of the punk explosion and the mod revival there was a blurry line between the two genres. For me, no band more epitomized the pure mod sound and still was able to incorporate the agression of punk than Long Tall Shorty. Always a mod band firmly rooted in sixties beat sounds, they never the less had punk vibe about them that fit perfectly into the mod revival. Founded in 1978 the band managed to maintain a very mod sound, and a very punk attitude. Riots seemed to follow them as much as anything making them one of the most loved bands by both mods and punks of the era. Their sound was a sixties infused power pop that fit well within the scenes of the day. But, they also managed to sneak in a fair amount of soul, turning their power pop into something more rhythmic and dancable than other straight ahead power pop outfits of the day. This track, "Win Or Lose", was one of their last recorded singles late in 1980. It was a pretty standard mod revival number. It had a solid sixties mod power pop feel to it, was melodic but at the same time offered just enough agression to keep it from being too accesible to the pop music mainstream. After a number of line up changes the band finally called it quits in 1982. 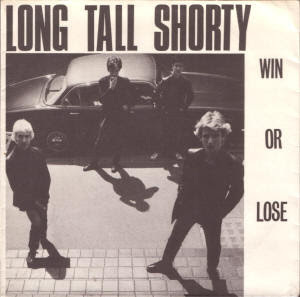 Time goes by and lo and behold a revamped Long Tall Shorty has reunited and been playing shows here and there the past few years, and the rumour is that there very well might be a new single and album in the offing. No matter, the excellent revival tracks of their original recordings are worth listening to until the end of time.